KB5000 is a right pinna with anthropometric concha and ear canal for KEMAR. It is made of soft silicone, 35 Shore OO hardness. The external shape of the pinna is identical to that of the standardized KEMAR pinna, but concha and canal have been modified so that they closely mimic the properties of a real human ear. The ear canal has been extended and is an integral part of the pinna that now seals directly against the ear simulator. Like the human ear, the ear canal now has the 1st and 2nd bend, and the interface with the concha is oval. 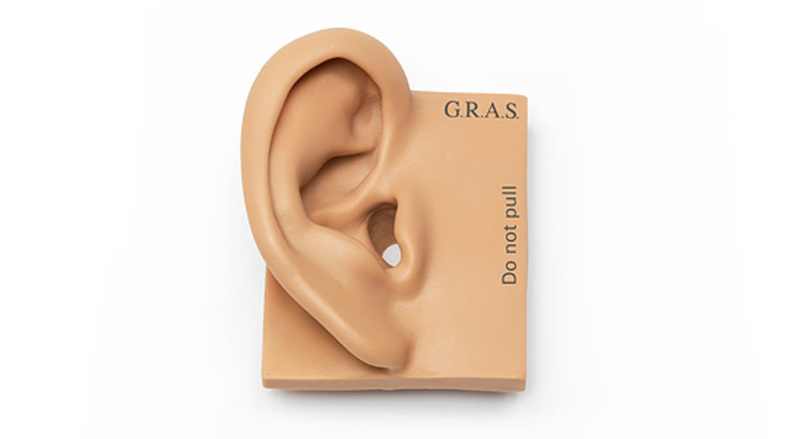 This shape makes it possible to achieve good insertion accuracy and sealing with anatomically shaped in-ear transducers such as ear-bud headphones, in-ear hearing protectors, and insert hearing aids. Controlling the insertion depth is easy, leading to better insertion consistency and improved repeatability of measurements. The better fit and seal also means that the low frequency response is improved. It will allow you to reproduce base response, as well as effectively measure (active & passive) attenuation. The outer pinna has the same shape as the standardized pinna, but the flexibility has been improved to better mimic the way the human ear collapses when supra-aural and circum-aural earphones are mounted. When measuring the frequency response of these types of headphones, more reliable and repeatable measurements can be achieved because of the improved collapsibility of the pinna. The pinna is screwed onto the ear simulator which in turn is fixed with screws that ensure that the pinna is held firmly in place. Therefore, the mounting is very stable, and it is possible to mount and dismount DUTs repeatedly without compromising the seal.